I don’t pretend to be an expert on the Korean pub scene, in fact I’ve only been to this one. But here, my older brother Bill and I were transported to what I imagine to be a secret hideaway in a back alley somewhere in Seoul. He served in the military in Korea and was happy to accompany me as I reviewed a dozen restaurants for a Korean restaurant publication. We began our experience at Dan Sung Sa with a complimentary seaweed soup, perhaps served for drinking stamina? And positively addictive shoestring potatoes curiously sprinkled with sugar. We were warned that Dan Sung Sa is not easy to find. It has no exterior signage in English, adding to the mystery and charm. This is a bar. Trippy, authentic, hip, smoky. We loved it. Definitely not a fine dining establishment by any means. 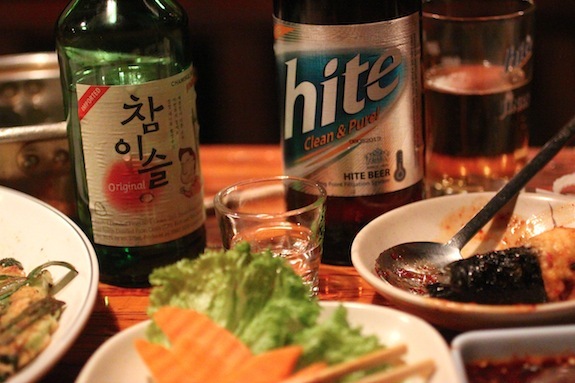 If you are looking for a place to imbibe and experience what could be Seoul’s cultural underbelly, this is the place. We drank Hite and soju, we ate esoteric ahn-joo. The service fit the atmosphere, the music was perfect. By the way – it was smoky…and not just from the grill. Soju is a Korean distilled beverage, traditionally made from rice, which tastes similar to vodka with a slightly sweet finish. 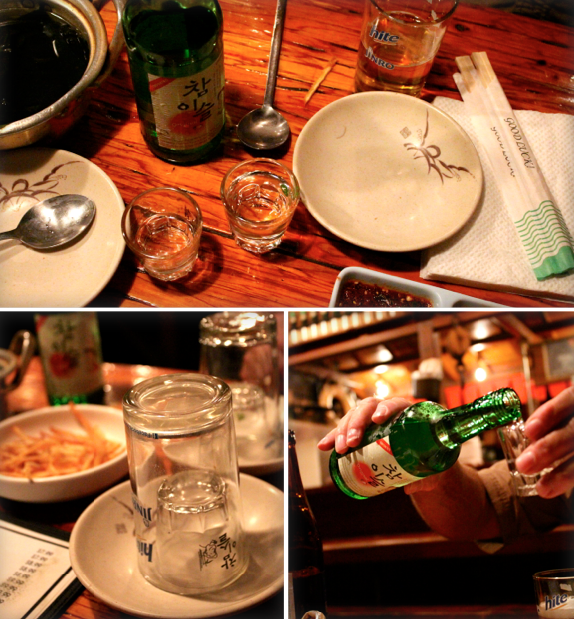 We enjoyed the soju neat, with a chaser of Hite beer, a clean pale lager. Cute-looking crystal noodle seaweed wraps were in the shape of little dumbbells. 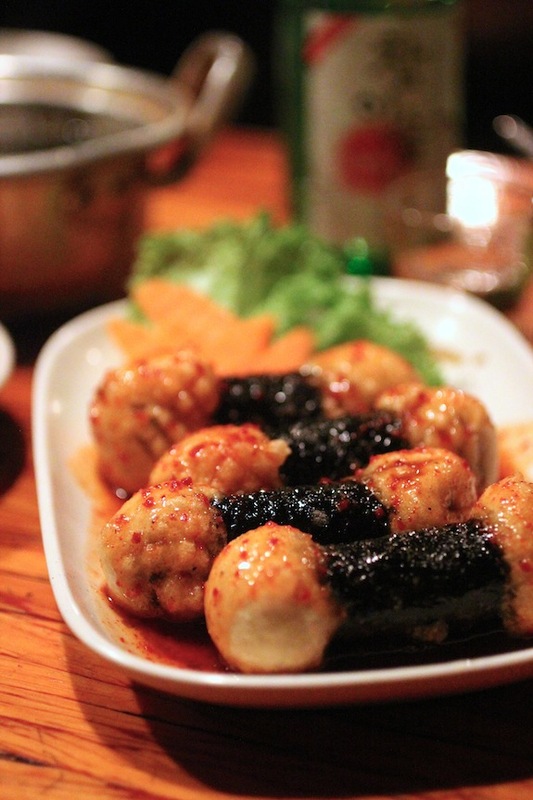 These kim mari are filled with jap chae noodles, the sauce is spicy and pairs well with cold beer. 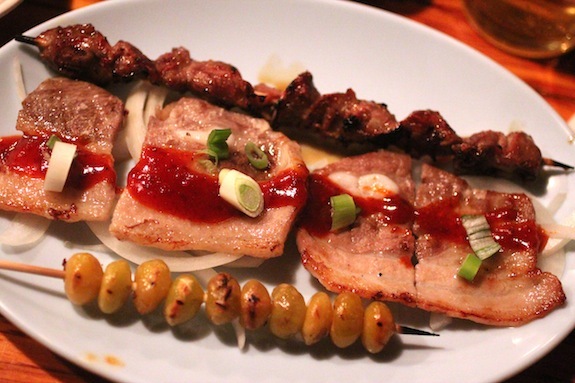 My easy-going brother didn’t mind that I ordered authentic pub food: skewers of chicken gizzards, pork belly, ginko nuts. 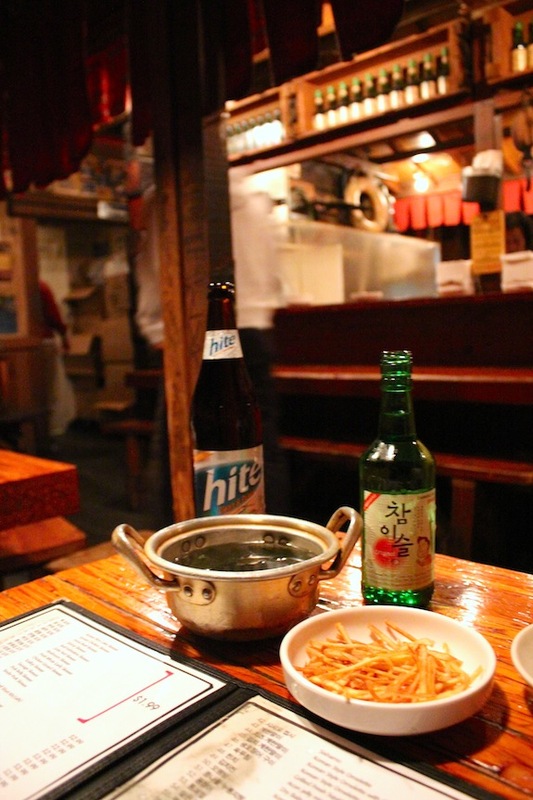 Forget that you’re on 6th Street in LA, and imagine that you are in Seoul. 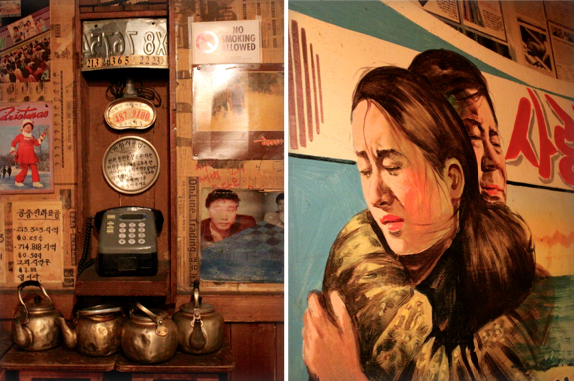 Dansungsa is named after Korea’s first cinema, it’s decor features period posters highlighting classic Korean films. 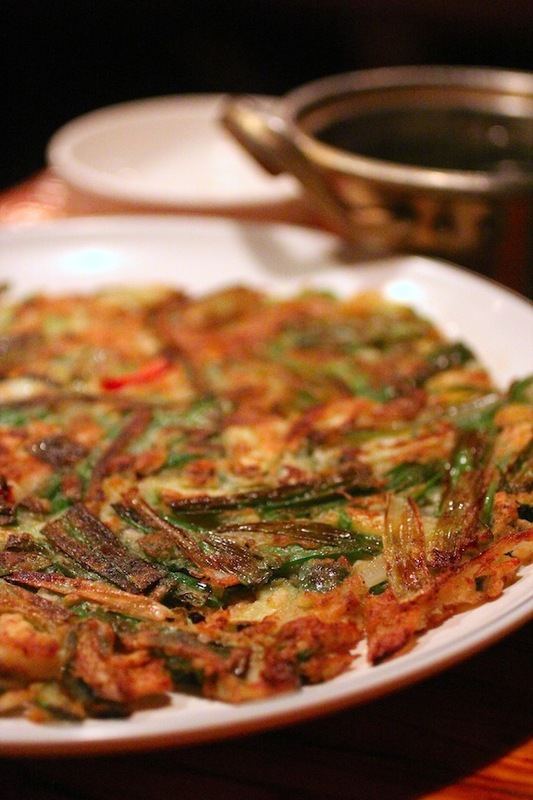 The haemul pajeon, a seafood scallion pancake goes best with makkoli (a milky rice wine). 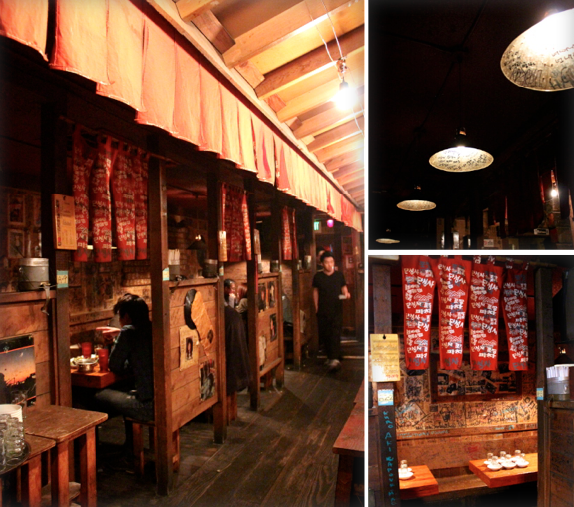 The lighting and wood furnishings, flags, wall art and graffiti help to convince us that we have traveled afar. We watch the women grill chicken feet and frog “back” leg skewers in the hazy open central kitchen. Honestly, I’m not sure it would be as fun if you don’t imbibe…at least just a little. If you want to take a trip without flying for hours over the Pacific, go! 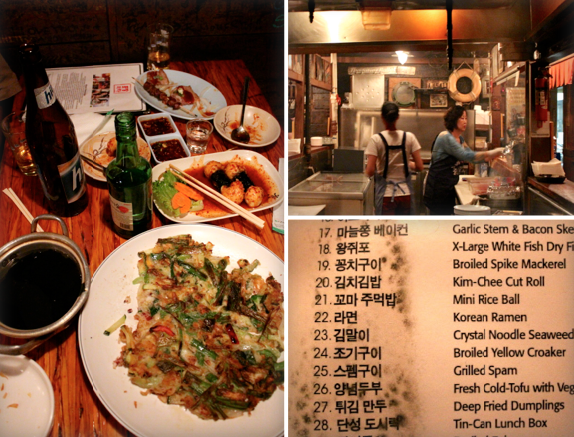 Go, definitely go to this pojangmacha (Korean gastropub) in Los Angeles! What a meal and what a place! I love the ambiance – it definitely makes it feel like you’ve traveled the world to get there. That haemul pajeon looks amazing and I’d love to try it at home…let me know if you plan on coming up with a homemade version and I will definitely follow suit! I’ll let you know when it’s posted! 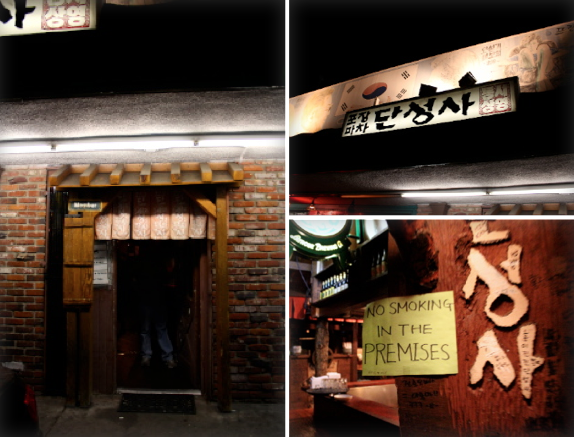 If you’re ever in LA put Dansungsa on your late night list of things to do! I felt transported. I could smell that smoke!!! I love this restaurant from the pictures. I noted and I’d love to go this place next time (maybe with you? :D)! I wish there was a Korean restaurant in our area….the restaurant you experienced sounds terrific. Looks like a fun place to spend the evening, eating and drinking to your heart’s delight! I love the atmosphere of this pub! It feels like I’m time travelling. I would love to try their Kimmari also, it looks different to what I used to. Thanks for this great post.